Being a parent is one of the greatest joys in life. But when your snuggly little baby grows up to be an energetic toddler, sometimes they’re hard to keep up with! Toddlers love laughing and playing any chance they get (that includes when you’re cooking meals or tidying up the house). Having a fun toy that keeps your playful child busy and active while you take the time to tend to other things is essential. That’s why in this article we’ll be covering 5 of the best toddler basketball hoops that we could find on the market today! Out of the basketball hoops for toddlers we reviewed, we decided that the Little Tikes EasyScore Basketball Set was our favorite. Not only is this basketball toy affordable, even for those who may be on a budget, but it’s also very highly rated by thousands of parents! The basketball hoop is adjustable and can move from 2 to 4-foot heights. It’s also made with an oversized hoop rim for your toddler to easily grab on to and comes with a miniature-sized basketball perfect for your child’s dainty hands. 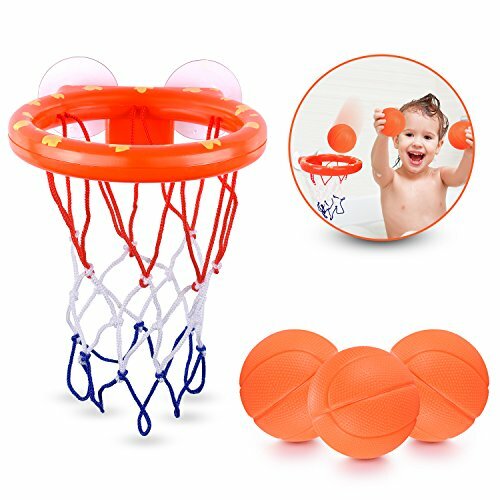 The basketball is made of soft plastic materials and has hardly any weight to it so your toddler can run easily with it, throw it, and put it through the hoop. They can even bounce the ball off of you or themselves if they want to, there’s nothing to worry about with this toy! The basketball goal itself is made with light, but durable (compared to the strength of a toddler) plastic material, and the wide base can be filled with sand or water to keep the basketball hoop from falling over. Although, it isn’t really necessary for the base to be stabilized in this way, considering that this toy was designed specifically with toddlers in mind. Affordable price, even for those who may be on a budget. Wide rim for your toddler to easily grab on to. Adjustable height from 2 to 4 feet. Highly rated by thousands of parents. Lightweight, soft mini basketball for easy throwing and no harm. Basketball goal base can be filled with sand or water for stability. For children ages 1-5 years. Basketball set grows with your child! The Fisher-Price Grow-to-Pro Junior Basketball Hoop is another great choice for your toddler. This set comes with a removable large and angled “sure score” rim so that your little one will never miss their shots! The height of this basketball hoop is adjustable with a maximum height of 40 inches and comes with a soft, bouncy, lightweight, plastic ball for easy throwing and safety. The build of this toy is rather sturdy and heavy enough for tipping to be a non-issue, but sand can also be added in the base if desired. It can be used indoors and outdoors and does stand up to the outside elements quite well (although it’s always best to store toys when the weather is too harsh). The price is more on the expensive side, but from what we can gather, this is a lasting toy that could be used all throughout your child’s toddler years (perhaps saving you money in the long run). 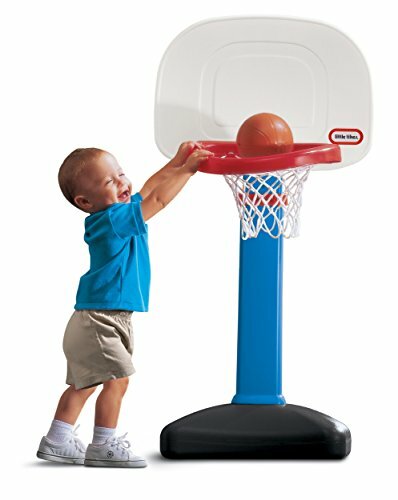 “Sure Score” rim to keep your toddler scoring. Adjustable goal height up to 40 inches. Soft, lightweight basketball for added safety and bouncy fun. The hoop is sturdy and doesn’t need sand filler in the base (but it can be added for more stability). Designed for indoor and outdoor use and does okay in the outdoor elements. A little pricey, but long lasting – so it may save you money in the long run. 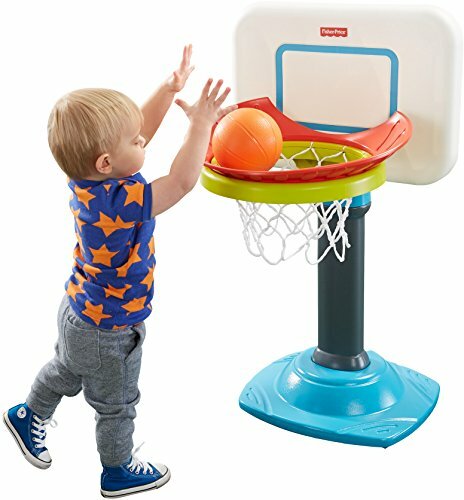 Center pole fixture adjusts rim height from 30" to 48"
The Shootin’ Hoops Junior Basketball Set is probably one of the cutest basketball hoops for your toddler we could find. Juice box or sippy cup holders are built into the base for your toddler to set their drink (or snacks) in as they play. How much cuter could that get? The base itself seems to be praised as rather sturdy with or without being weighted down with sand or water. However, some parents have recommended filling the base for added stability – and we think you should, too (just in case). The rim of the goal is adjustable, which can be as short as 30″ or as tall as 48″. The backboard is broad with a sturdy rim and a woven net that’s lasting and durable. This set comes with a soft, plastic ball that is able to be inflated with an air pump once it begins to go flat. Although, unlike with other sets on our list, this set doesn’t come with an air pump. The adorable sippy cup holders in the base of the basketball hoop. Adjustable height from a minimum height of 30″ to a maximum height of 48″. A rather sturdy base that can be filled with water or sand for added stability. Broad backboard for easy shots. Sturdy rim with a durable, woven net. Soft, plastic basketball toy that can be inflated once flat. Somewhat on the expensive side, which may not be suitable for those on a budget, or not looking to pay too much for this type of toy. 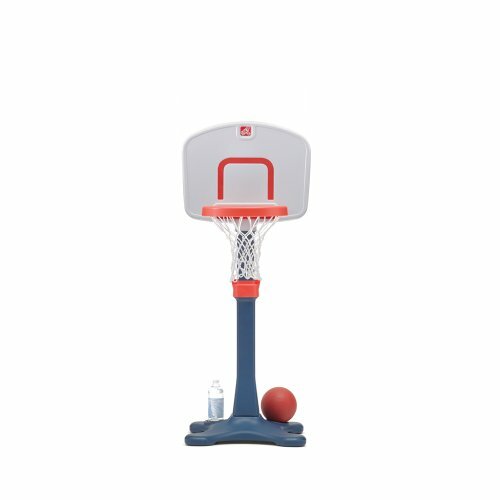 Unlike other toddler basketball hoop sets, this set doesn’t come with an air pump for the ball. Though this isn’t a full toddler basketball hoop set with all the works, this basketball shooting game would still be a blast for young kids! This miniature basketball hoop has two suction cups on the back to attach the goal to the inside of a bathtub wall (or other places around the house). It comes with three small, soft plastic toy basketballs that will keep your kids entertained the entire time they’re getting washed up! Another great thing about this set is the price. This toy isn’t only an absolute joy for children, but it’s also incredibly affordable, even for those who may be on a tight budget. The inexpensive price, which is great for those on a tight budget. Sturdy suction cups that attach to practically any flat surface. Comes with three miniature toy basketballs, in case one is lost or there are more than one child playing at a time. You won’t have to deal with lugging around a full basketball hoop or filling the bases with sand or water. Some have complained that the netting comes undone when tugged on, so it may be best to ask your children not to grab the netting as they play. Although this is the most expensive choice on our list, the Step2 Game Time Sports Climber and Slide seems to be one of the most fun basketball hoop toys available on the market! This is a miniature jungle gym with a climbing ladder, built-in basketball hoop, and slide. Along with the basketball hoop is a score chart with clicking knobs so you can keep up with who’s winning the game! This set is a durable, lasting, easily-assembled toy for toddlers and comes with a plastic ball that can be kicked through the tunnel or thrown in the hoop. 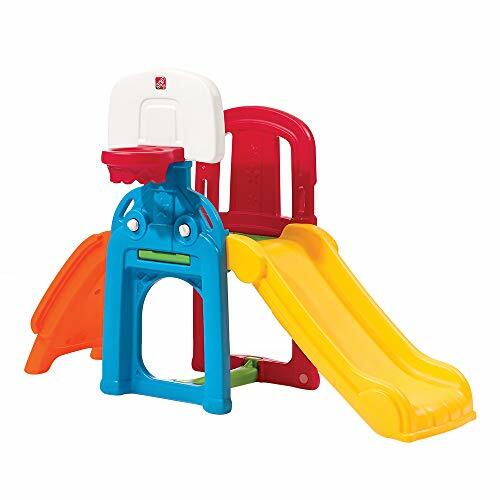 The Game Time Sports Climber and Slide are perfect for the energetic, playful toddler. Easy assembly so your toddlers can get playing! Made of sturdy, lasting materials for years of toddler fun. Comes with a ball for shooting in the hoop or kicking through the tunnel. Made with a climbing ladder and slide to keep your children entertained. This set is rather expensive, which may not be suitable for those who are on a budget or not looking to spend such a pretty penny. Perhaps the most important aspect to consider when you’re looking to buy a basketball hoop for your toddler is the price. It’s a good idea to know how much money you’re willing or able to spend on a toy like this. Keep in mind that price often reflects quality. Usually, the higher the price, the better quality or more features the toy may have, and the lower the price, the less durable the product may be. If you think your child or children would really enjoy a basketball hoop toy, then a more expensive and lasting toy may be the best option. Contrarily, if your toddler loses interest in toys easily, a cheaper option should be looked at. For the most part, basketball hoops for toddlers can be used both inside and outside. However, some basketball sets may require sand or water added in the base for stability reasons. These sets could possibly make indoor use inconvenient, and therefore be best for outdoor use. It’s a good idea to decide whether your toddler will be shooting hoops primarily inside or outside and then choose a toy basketball hoop accordingly. As we mentioned above under the “Price” category, better quality usually comes with a higher price tag. When looking to buy a toddler-sized basketball hoop, it’s best to find a product that can hold up to the tugging and rambunctious playing of a growing child. This includes thicker plastic, sturdy bases or bases that can be filled with sand or water, and rim heights that can be adjusted. The choices we listed previously were often praised for their quality and stability, so be sure to read those for yourself if you want to see what other parents had to say. Little Tikes: Founded in 1970, Little Tikes has been dedicated to creating fun, eye-catching, durable, and safe toys for toddlers and have been a trusted toy brand for over 48 years. They manufacture toys ranging from slides and sandboxes to playhouses and ride-on toys and offer a wide variety of fun-filled play to choose from. Fisher-Price: Founded in 1930, Fisher-Price has been one of the most trusted toy companies for nearly 90 years. At Fisher-Price, they’re dedicated to bringing parents safe, fun, and dependable toys for their children. Like Little Tikes, they offer a wide variety of toys to choose from and are constantly looking for innovative ways to improve their products for the enjoyment of your toddlers. Step2: Founded in 1991, Step2 has been dedicated for over 20 years to bringing kids colorful, safe, and durable toys that encourage creative play and the development of your children’s imagination. They are the largest American manufacturer of preschool and toddler toys, and they intend to keep it that way with their ever-growing employee base. Leapfrog: Founded in 1995, Leapfrog has been dedicated for more than 20 years to bringing your children fun toys that help them learn during their developmental stages. They combine technology with traditional play to encourage your toddlers to grow and become confident in learning. Plantoys: Founded in 1981, Plantoys is a children’s toy company dedicated to bringing your children engaging toys made of sustainable and safe reclaimed rubber woods. Their mission is to help the planet and help your children develop in their creative play during the earliest stages of their lives. Q: Should I buy a toddler basketball hoop that comes with a foam toy basketball? A: You should avoid toy basketball hoop sets that come with foam toy balls. Toddlers tend to chew on their toys and if they happen to tear the foam, it could potentially become a dangerous choking hazard. We recommend looking for sets that come with a soft plastic toy basketball. Alternatively, you can look in stores and find any small, plastic ball that will work with the set you purchased. Q: Can these toys be left outside? A: If you purchase the toys on our list (apart from the bathtub toy) or toys similar to those we chose, they should be able to be left outside with no problems. Toddler toy basketball hoops and sets are made of durable, lasting majority-plastic materials that will withstand the elements. However, if left out in the sun for extended periods of time, the colors on the toys will eventually fade. Another thing to keep in mind is wind. If the wind is too extreme, these toys can definitely blow away, so be sure to store your toddler’s outdoor toys if the weather becomes harsh. Q: Is it better to add water or sand to the hoop’s base? A: Either one will work fine, however, we recommend adding sand rather than water. Water should be changed every now and again, especially during hot seasons as it may become rancid. Sand, on the other hand, will stand up much better to the weather conditions than water will, therefore saving you from having to clean the base often. Q: Are off-brand toddler basketball hoops as good as big-brand toys? A: They may be, but it’s best to read reviews if you’re shopping on Amazon to get a good idea of their quality. However, from our experience, big-brands like Little Tike and Fisher-Price have been trusted by parents for decades and therefore create lasting, trusted products that you can depend on. We recommend purchasing items, like the toys we listed at the beginning of this article, from the companies that have made a name for themselves. We believe that all of our choices would make great basketball hoop toys for your toddler. After researching and listing the best toy basketball hoops we could find, we decided that our favorite was the Little Tikes EasyScore Basketball Set. The high quality, great reviews, included ball, and adjustable height convinced us that this is by far the best toddler basketball hoop on the market today. We hope you enjoyed our article and gathered the information you need to purchase your toddler a toy of their own! Happy playing!